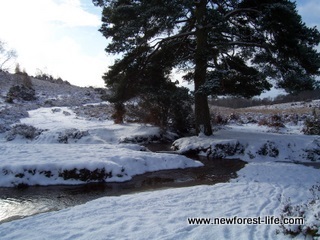 New Forest snow 2010 was it a winter wonderland? But is it a winter wonderland for the animals? New Forest snow 2010 occured at the very beginning of that year. It looked really beautiful, and does look like a winter wonderland. Everywhere is totally white and it is absolutely freezing! as you will see from the following photographs I have just taken. But is it a winter wonderland for the animals which have to survive out on it? Let me share with you what I have seen out on my dog walk today! And let me explain what this means to the ponies, donkeys, cows and even any pigs that may be out. Update April 2010 - We lost our dog today so no more dog walking for us. 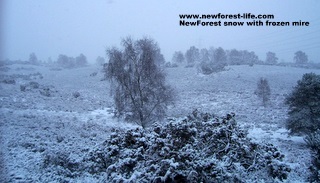 Look at the contrast between this beautiful New Forest valley today, in winter and spring/summer 2009. 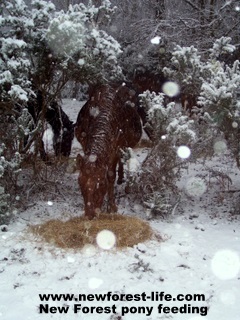 The animals have to be hardy enough to adapt to all weathers - even when they are as extreme as this today. 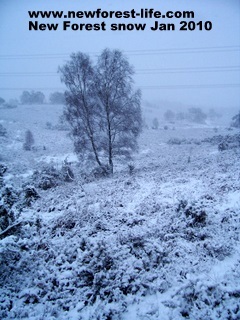 So, if you are out, like me, on the New Forest today this is what the weather is like. As well as lots of snow falling and really low temperatures (obviously), there was a nasty wind blowing. Depending on which direction I was walking in it covered me in snow down the front and blew my 2! hats off or nearly made me fall over - what fun dog walking can be? 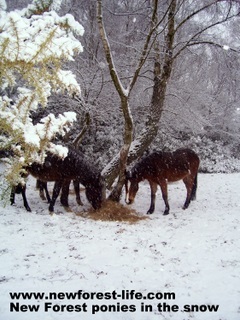 These two New Forest ponies are lucky enough to be fed in these extreme snowy conditions by their Commoner owner. 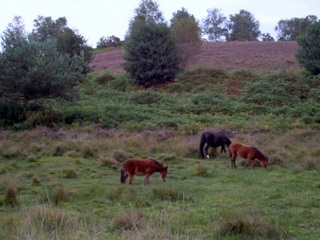 Each animal you see on the New Forest is owned by someone who has Commoners Rights. 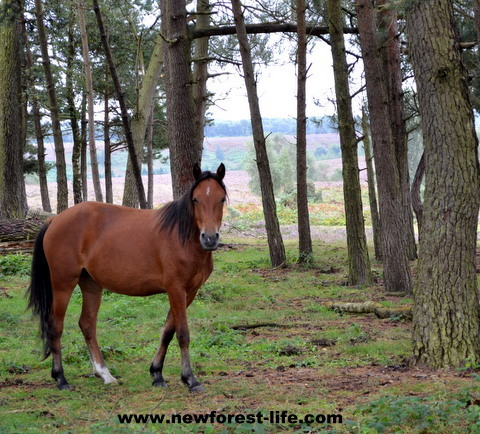 The animals must be checked and kept healthy at all times, otherwise they wont be allowed onto the New Forest. At this time of year many of the ponies may be pregnant with this years foals. They will be eating for two! Unfortunately, they may not manage to get enough food in severe weather like this to stay healthy and warm and also eat enough to nourish a future baby. 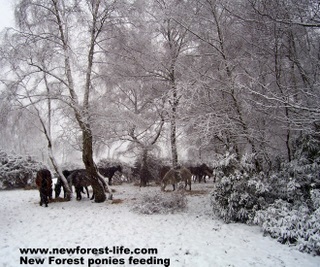 Not all New Forest foals which are born survive - especially if they are born earlier in the year when the weather is cold and wet. 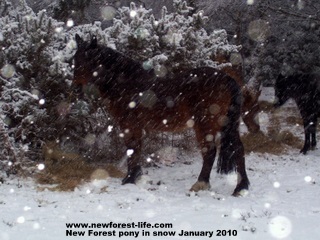 The New Forest pony is a very hardy outdoor pony and can usually face all weather extremes well. The danger of weather like this is twofold. The ponies coats are made up of various levels of hair. All provide insulation and if you look up close you will see that the top coat apart from looking really thick has a dense layer of quite long, fine hair. This layer provides the insulation against the wind and cold temperatures and combined with the thicker layer should keep the pony warm and well insulated through a hard winter. Last night was a wet night and so the top layer of fur had got very wet. this means they had gone into the night with wet coats which could not provide good insulation. This is when the cold can penetrate deeper and they will have more of a struggle to keep warm. Although this isn't the best photo in the world, when I took it today, I think it shows just how awful the weather can be for the ponies and other animals out on the forest. This is one of my favourite old geldings and he features throughout my website - looking very handsome in his rich, sleek summer coat or like this image, just struggling to stay alive. The New Forest is a beautiful, and I think unique, environment. It is also very harsh for the animals. I think you may agree?